Supermarkets were already grappling with stiff competition from multiple channels—discounters, warehouse clubs and drug, dollar and convenience stores, among others—when in August 2017 Amazon turned retail grocery upside down with its acquisition of Whole Foods Markets. The e-tail giant’s entry into brick-and-mortar grocery led supermarket operators of all stripes to rethink pricing and store counts, enhance their in-store experience, and fast-track plans for online grocery shopping and delivery. Amazon’s disruption, too, has clipped grocery retailer stock prices, contributed to store closings and retailer bankruptcies, and pushed industry leaders such as Walmart and Kroger to shift gears and step up investment in e-commerce. Aldi, meanwhile, is sticking to a formula that has propelled rapid growth and lifted the German hard-discount grocer into the top rungs of the U.S. retail grocery market by number of stores. The retailer, whose U.S. headquarters is in Batavia, Illinois, offers a unique, curated selection of high-quality private label products in a compact store format and attracts customers with hard-to-match, everyday-low prices and a simplified shopping experience that eschews promotional frills. Now with about 1,800 locations in 35 states, privately held Aldi is more than a year into a $5.3 billion, five-year expansion program that will enlarge its store base by almost 50 percent and upgrade most of its stores. Dovetailing with that initiative is a major product expansion, announced early last month, in which 20 percent of items in every store will be new versus a year ago. CEO Jason Hart (left) said Aldi has doubled its sales volume over the last five years and expects to double it again over the next five years. “Aldi is really clicking on all cylinders right now,” he said. Because of Aldi’s brow-raising growth and success with a well-disciplined business model that’s resonating with consumers in a time of industry turbulence, Supermarket News has named the company its Retailer of the Year for 2018. “Aldi is really clicking on all cylinders right now. At a time when other retailers are struggling, Aldi is thriving, we’re investing and most importantly we’re better meeting the needs of our growing customer base. We’ve always been growing steadily, but more recently we’ve accelerated our growth plans due to the rising demand for Aldi,” Hart told SN in an interview. “Customers recognize that the more convenient we can make Aldi and the more products they can buy at Aldi, it saves them more time and more money,” he said. Last year, Aldi opened 135 new stores, and in 2018 the retailer is aiming for 150 new locations. The company in June 2017 unveiled a $3.4 billion expansion plan that by the end of 2022 will broaden its retail base to 2,500 stores—serving 100 million shoppers per month, up from over 45 million currently. “Our plans are to continue on this aggressive growth track by answering consumer demands regarding where, how and what they want to shop for,” Hart said. In February 2017, Aldi embarked a $1.9 billion program to remodel and expand more than 1,300 stores by 2020. The remodels bring a more modern design, open ceilings and natural lighting plus more refrigerated space for fresh foods, including enhanced produce, dairy, meat and bakery sections. The chain’s stores average 12,000 square feet of selling space and keep the shopping trip simple with only five aisles to navigate. “We’ve been investing heavily in our existing network of stores. We’re remodeling and expanding our entire network of stores over a three-year time period. What that’s doing is giving us a little more space to merchandise our products. On average, it’s giving us 20 percent more salesfloor square footage,” Hart said. The redesign features more refrigerated space for fresh foods and an enhanced produce selection. The new-product effort—focusing on fresh, organic and easy-to-prepare offerings—will boost the selection of fresh food by 40 percent . Plans call for the rollout to run through early 2019. “More and more consumers are coming into our stores, and their demands are changing quite rapidly. They want more products that are healthier for you. They want more fresh, which is leading us to expand exponentially our fresh produce, fresh meat and organic products—anything healthier for the consumer,” Hart said in announcing the product expansion last month at Aldi’s store in St. Charles, Illinois. With many of the new offerings, Aldi is looking to help customers make meal preparation easier. That includes more ready-to-cook and organic fresh meat; a bigger assortment of produce, including ready-to-eat sliced fruit; more organic produce; and new vegan and vegetarian options. A wider array of convenience-focused, grab-and-go fare also is being rolled out to stores as Aldi adds refrigeration space. Customers, too, will find more easy-to-prepare meal starters as well as additional baked goods. Aldi said it also will have one of the nation’s largest selections of private label milk alternatives with the addition of organic almond milk, coconut milk and a full range of lactose-free and soy milk. Hart noted that the product expansion spans Aldi’s range of own brands, including SimplyNature (natural and organic foods), Earth Grown (vegetarian and vegan foods), Specially Selected (gourmet specialty foods), Never Any! (antibiotic-, hormone-, steroid- and animal byproduct-free meat), liveGfree (gluten-free foods) and Little Journeys (baby care). “All of those are the growing brands at Aldi, and we need more room for them. That’s why we’re doing this remerchandising,” he said. 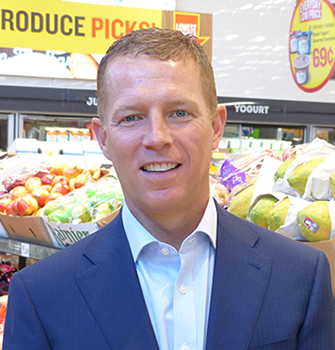 For the new-product push, Aldi engaged in in-depth market and consumer research and tested new items in stores, according to Vice President of Corporate Buying Scott Patton. That effort included the “Aldi Finds” feature, which highlights food and household products offered in stores for a limited time and is intended to lure customers back to check out what’s new. More than 90 percent of the products carried by Aldi are private brands, which Hart said has been the cornerstone of the retailer’s business model since entering the U.S. market in 1976. “Private label is who we are, and it’s who we’ve been for over 40 years,” Hart said. “And [our brands] don’t come with the big, national-brand advertising budgets and inefficient distribution system. By having a carefully and purposely selected number of SKUs, this allows us to have much more volume per product SKU, which makes our suppliers more efficient and makes our cost prices better. Therefore, we can pass that on in lower retails. “Our disciplined approach to simplicity and efficiency drives everything that we do,” Hart noted. The focus on private label means quality control is paramount for Aldi. Its test kitchen is one of the busiest areas of the Batavia headquarters. About 50,000 product variants are tested annually—up 15 percent to 20 percent over the last few years. “We’re extremely meticulous about product quality,” VP of Corporate Buying Joan Kavanaugh said in a tour of the test kitchen. About 50,000 product variants are tested annually—up 15 percent to 20 percent over the last few years—and on average it takes nine months for a new product to go from concept to shelf. Aldi’s private label approach underlies what Hart said customers like best about shopping at its stores: the ability to save money on their grocery bill without sacrificing quality. “When they come into the store, they are amazed by the prices and have the ‘a-ha’ moment at checkout when the cashier hits total and they thought the bill was going to be over $100 and it’s maybe $55,” he said. In a Market Force Automation survey this year of nearly 13,000 consumers, 90 percent named Aldi as offering the best value for the money—ranking it No. 1 among U.S. grocery chains. Market Force’s 2018 U.S. Grocery Benchmark study placed Aldi fourth among the nation’s favorite grocery stores, based on customer satisfaction and loyalty. In addition, Aldi came in at No. 3 in checkout speed and No. 5 in cashier courtesy. More U.S. consumers will be getting a taste of the Aldi experience. 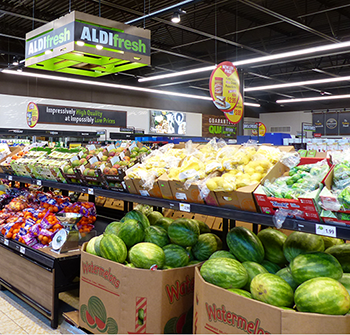 While most Aldi stores are in the middle of the country—with concentrations around St. Louis, Missouri; Chicago, Illinois; and Cleveland, Ohio—the retailer has expanded its footprint to Texas, Florida, California, the Carolinas, the Northeast and Virginia. Under the current expansion, Aldi will enter some new markets, Hart said, declining to specify. “You could look at the map on where we cover, and there are a couple of holes that we’ll fill in,” he said. Aldi also is reaching out to more customers online through Instacart. The retailer piloted the same-day grocery delivery service in the Atlanta, Georgia, Dallas, Texas, and Los Angeles, California, areas in August 2017; in March, they expanded it to Chicagoland, northwest Indiana and west toward Rockford, Illinois. Aldi is well-known where it has a density of stores, while awareness of the banner and its distinct shopping experience is taking root in newer markets, according to Hart. However, the company is bullish that consumers who try Aldi will like it and make it a regular stop on their grocery shopping trip.